Just when you thought you had a handle on social media, along comes something new – Pinterest. If you’re like me when I first got started on Pinterest, you might be asking yourself how to identify content worth pinning and build a following. The fact is, as I’ve learned, if you have a website and are active on social media – you have content to pin and content worth following. 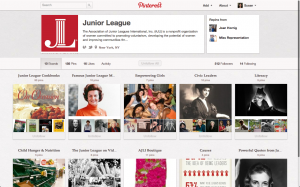 For a better sense of how to proceed, the following is how I got started pinning for an organization I work with, The Association of Junior Leagues International, Inc. (AJLI). Website: If you’re familiar with The Junior League you might know about Junior League cookbooks – a fundraising staple for many decades. 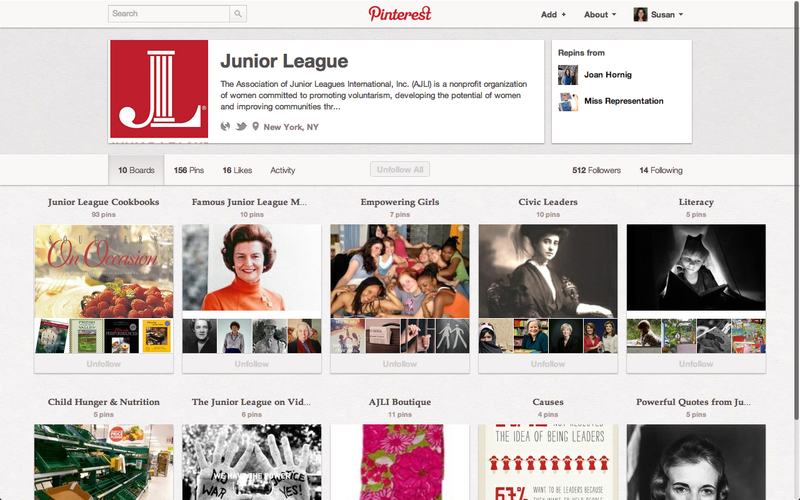 My first pin board consisted entirely of Junior League cookbooks on the AJLI website. The cookbooks reflect regional food cultures and purchases direct money back to local communities. Each pin indicated that the featured cookbook was for sale – simply begin your comment with item’s price. The pin comments also describe how the Junior League that published a particular cookbook uses funds raised. Food is a popular is a category on Pinterest and the cookbook board got us off to a great start building followers. Blog: Long before we had ever heard of Pinterest, my team at AJLI decided to make visuals an important part of our blogging strategy. Since getting blog content ready for publication is part of my job, I spend a lot of time looking for compelling visuals. Finding great visuals isn’t the easiest job but it helps readership and has given us content for Pinterest. I’ve used our own blog posts to create boards that highlight the issues that matter to our volunteers such as empowering girls and hunger. Video: Using the videos on AJLI’s YouTube and Vimeo channels was a given. Some of the video content includes a history of The Junior League and several short videos meant to inspire our volunteers. The next step will be to add video our volunteers have created and news items that feature our volunteers. Facebook and Twitter: In addition to following every Junior League that is on Facebook and Twitter, I follow nonprofit partners and sponsors. I turned to the lists of Facebook and Twitter users that we follow for guidance on who to follow on Pinterest. The organizations that we follow are creating great content on other social networks and are doing similarly on Pinterest. After finding and following them it becomes a matter of simply liking and repinning their good content. We’re still growing on Pinterest but so far we’ve had a really positive response from our online community and look forward to continuing to give them the good content they enjoy and deserve.